Well it seems that Poodle clowns Murray, age 2 and Scout, age 6, were in the water once again this past weekend. 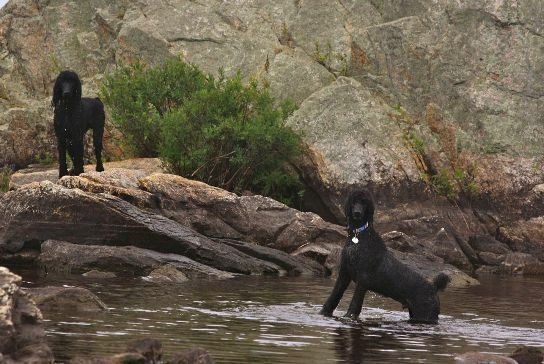 These two can take even the most picturesque setting (this time at Great Pond, Aurora, Maine) and add a bit of humor. Chris has been so kind through the years to send photos for the poodle blog, as well as photos of "real dogs" for my dog training blog. Rick Miles is another wonderful Poodle photographer who has been very generous in contributing photography for my articles through the years. Also special thanks to Scout and Murray! Quick note now, nine years later...(February 2019) Rick Miles, perhaps I need to work on an article about unusual colors of poodles, since not everyone knows they come in multi-colors! I would love to introduce your lovely black and tan phantom poodle puppy to the blog readers. 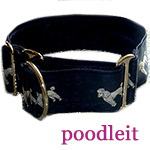 I only recently purchased back the Poodle blog, and am working on rebuilding the readership that we once had. Nothing like an adorable puppy and her antics to interest poodle lovers, so if you and your pup want to help, just let me know! Also, I would love to do a tribute to Houdini, your beautiful black Standard Poodle, with some of your favorite photos and memories of him. I would even love to know what you feel contributed to his longevity, because even though their time with us is always too short, not many of us have had the blessing of having a Standard live to be sixteen years old. Houdini was a very special boy, and I know he is dearly missed by everyone who came in contact with him.